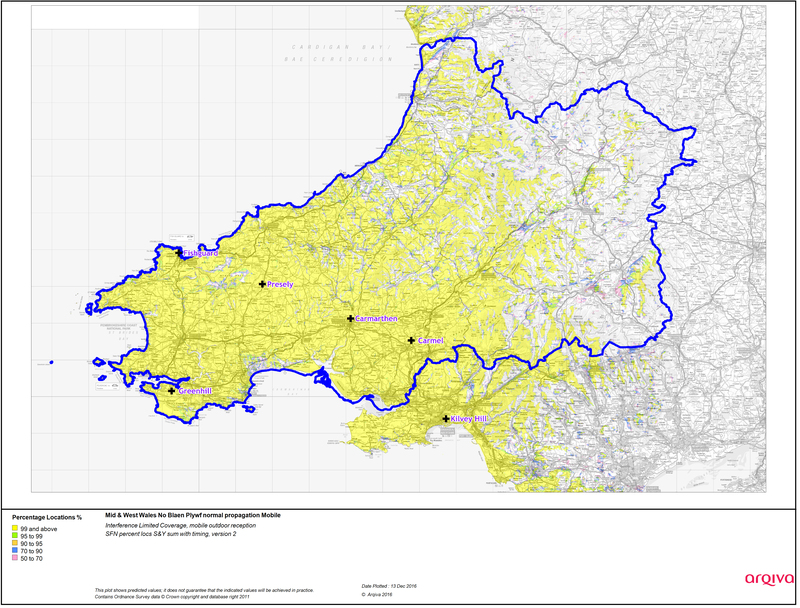 The PPA for Mid & West Wales covers 214,845 households. Within this defined area, our multiplex covers 116,358 (54.2%) of these households. The total number of households covered by the multiplex is 285,070. If there are any stations that you listen to at the moment on analogue radio that you would like to hear on DAB, we suggest that you contact those stations directly, encouraging them to join the multiplex. We do, however, currently have room for additional stations to join the multiplex. If you represent a service that would like more information about joining, please submit the questionnaire at the bottom of this page. In Mid and West Wales 41.9% of radio listening is to digital radio. 56.7% of the county have DAB sets. The multiplex currently broadcasts from transmitters at Carmel, Preseli, Kilvey Hill, Greenhill, Fishguard and Carmarthen. Other transmitters may be launched during the licence term to enhance and increase coverage. The multiplex is owned by MuxCo Wales Ltd, and launched on 30th August 2013.